There’s a lot to consider when choosing kitchen cabinets, doors & drawers, this step-by-step guide will help you choose the perfect cabinets and doors for your new kitchen. Melamine Doors - Melamine doors are a popular choice with a flat profile, available in an extensive matt colour range including textured, timber grain and ravine finishes. A great base for achieving your desired style by mixing and matching with varying textures, tones and finishes. 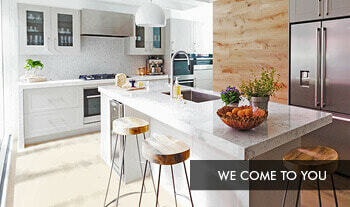 Refer to door ranges Helensvale, Ballina, Washed Oak and Chadstone. Vacuum formed doors - Vacuum formed doors offer a durable finish with the option of having a profile on the door. The vinyl is wrapped around the door (including all edges) and then heat sealed. Choose from a wide selection of colours as well as finishes including textured, woodgrain or high gloss to suit your kitchen style. Refer to door ranges Caringbah, Carseldine, Naree and Somersby. Artarmon Gloss - The Artarmon Gloss is an ultra-high gloss door, available in a range of contemporary colours and is ideal for achieving a sleek, modern look. It is manufactured and produced in a variety of striking European inspired colours. A great choice for those seeking a Hampton’s, coastal or French Provincial style kitchen. A contemporary door style for those looking for a sophisticated finish. The perfect door style for those wanting a modern Hampton’s, coastal or French Provincial inspired kitchen. Choose any door type from for our door range and add a glass inset to create vintage or traditional elegance. A simple door for a traditionl style kitchen or choose a matt finish for a more modern feel. This grooved door style is perfect for creating a relaxed country or beach style kitchen. 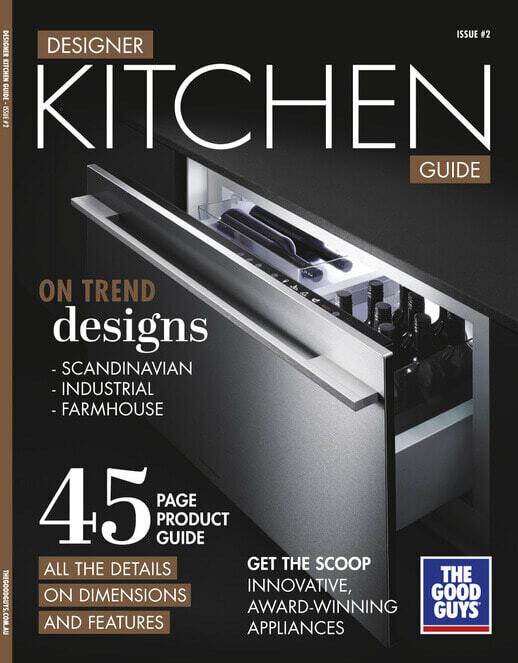 Contrast cabinet and benchtop colours to create impact in your kitchen. Bold colours can create sharp lines or highlight different preparation areas. Choosing complementary benchtop and door colours creates a seamless design palette and can make a room feel bigger. Matching cabinetry colours throughout your entire kitchen creates a cohesive room feel. Contrasting or multiple cabinetry colours makes a bold style statement and creates a focal point in your kitchen, especially when used on feature wall. Once you have considered materials, finishes and styles for your kitchens doors and drawers view our colour ranges here. 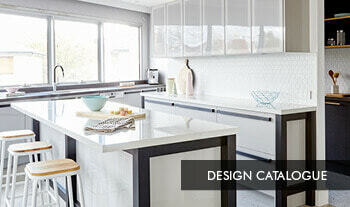 You can achieve different looks by complementing or contrasting your benchtop with your cabinetry. Once you’ve picked your doors, choosing handles for your cupboards and drawers is pretty simple. With clever storage solutions you can make sure no space is wasted and you can find what you’re looking for fast.